Outdoor blinds offer a number of benefits: they provide shade from the sun, protection from the weather in winter, and privacy from those annoying neighbours. With winter in full swing, you’re probably well aware of how a cold, wet afternoon can put a dampener on your plans. The wind and rain can make spending time outside almost unbearable, and even in summer you have to deal with the issue of heat and glare. Fortunately for you, that’s where Australian Outdoor Living comes in! We offer a great range of outdoor blinds that will protect your space from the weather. We know having so many options can be overwhelming, that’s why we’ve put together this complete guide to outdoor blinds. We’ll walk you through every style of blind as well as each operation system and how it can benefit your home. After all, we’re here to help you find the right option to suit your needs. If you’ve ever been to a café with an outdoor seating area, chances are you’ve seen cafe style blinds. They come in either a clear or a tinted style, so they’re a practical way to block out the elements without losing the view! 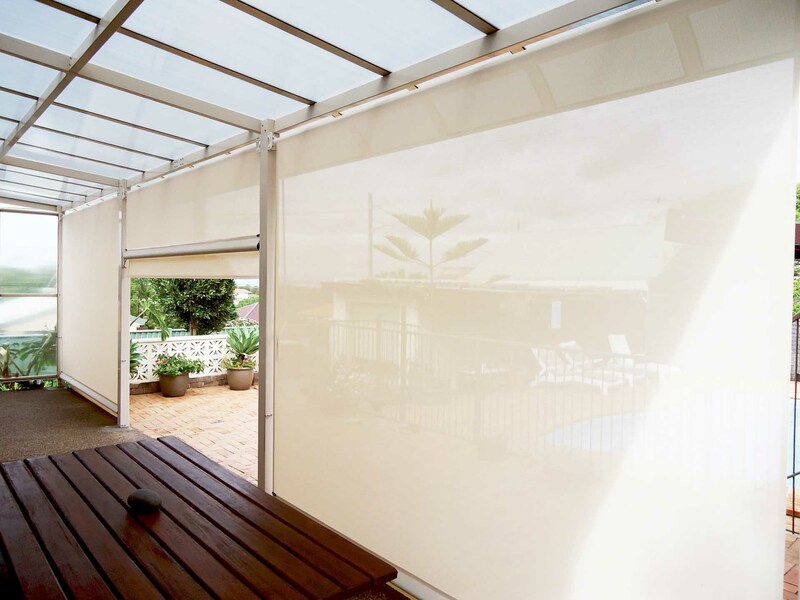 Here at Australian Outdoor Living we offer two styles of café blind. The Bella Crystal series is completely clear, yet still offers ample protection from UV rays, wind and rain. They also offer great insulation, meaning you can enjoy your time outdoors on even the coldest of days! The Bella Bronze series is designed with a slight tint, meaning they are less transparent than their Crystal counterpart. They come with all the same benefits as the Crystal style (UV, wind and water protection); it’s just harder to see through from the outside! While both of these options would be fantastic additions to your home, it is important to remember that since they are mostly transparent, colour options are limited. Both of these styles are available in our Classic operating system, giving you complete control of the tension of the blind. Bella Crystal and Bella Bronze outdoor blinds would both make fantastic additions to any pergola, verandah or patio. They add a touch of class and practicality to any outdoor area. What more could you want? A complete guide to outdoor blinds. Our Bella Vista shade blinds will let you enjoy your outdoor entertaining area in protection, comfort and style. The main attraction of the Bella Vista material is that it allows you to experience your beautiful view from the comfort of the cool shade. While this blind won’t be as effective in keeping out the wind and rain, it will do a better job of keeping your space private. You’ll also get top-notch protection from UV rays as well as a high level of insulation. These blinds also offer a much higher level of privacy thanks to their reduced transparency, meaning any nosy passers-by will have to look somewhere else! The Bella Vista range comes in a whopping seven colours, which means you won’t have any trouble finding one to suit the style of your home. On top of this, they can be operated using either the Classic operation system or the Motion operation system. 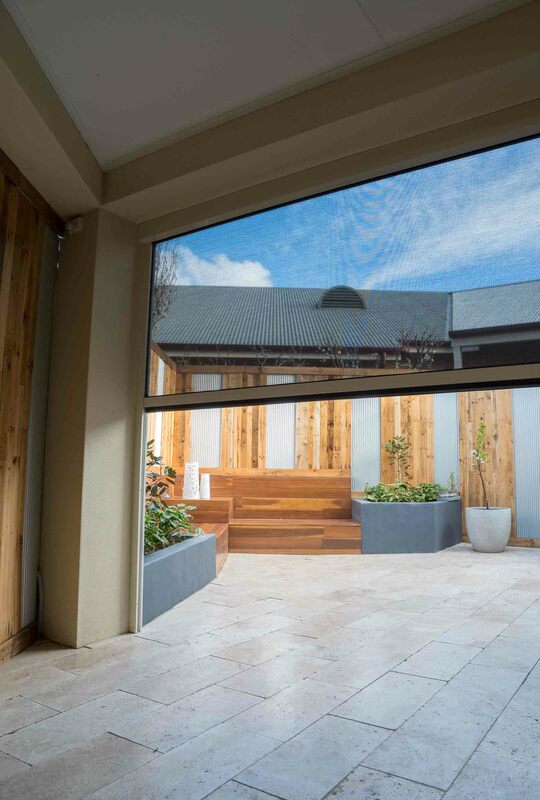 Outdoor blinds offer shade for your verandah, patio or pergola. Designed with the entertainer in mind, our Bella Opaque range offers the highest level of privacy you could possibly ask for. They are capable of blocking out 99 per cent of UV rays, guaranteeing both you and your outdoor area complete protection from the sun. On top of this, the Opaque range also offers a very high level of wind and water protection, as well as great insulation. If you’re looking for privacy, comfort, style and protection all in one neat little package, the Bella Opaque range is the perfect choice for your home. The best part is, these blinds are available in both our Classic and Motion Series operation systems. Outdoor blinds also come in a range of colours and operating systems. How do outdoor blinds work? We’ve spoken about our range of blinds, but at this point you’re probably wondering how they actually work. 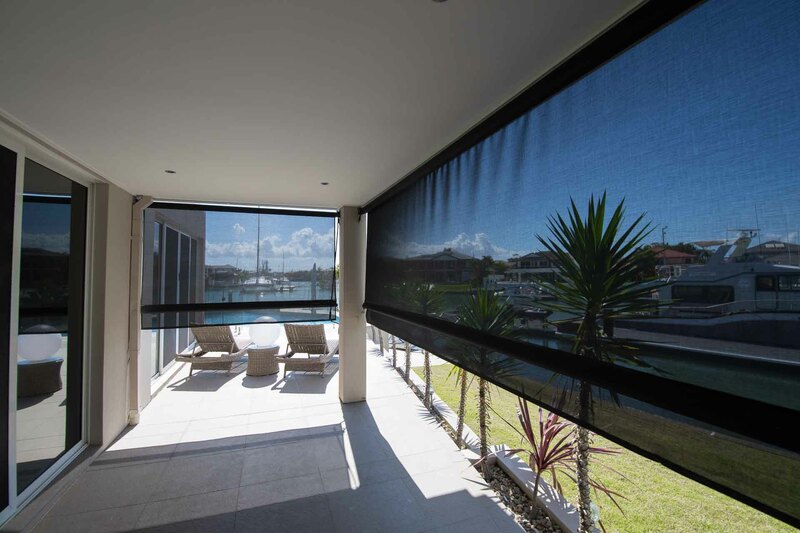 Here at Australian Outdoor Living we offer three choices of operation system for outdoor blinds: Classic, Manual Motion and Motorised Motion. The Classic Series is the traditional method of operation, offering the user complete control of the tension of the blind. Using a gear rolling mechanism, this manually operated system ensures the blind remains taught at any height. This system is usually the cheapest way to operate your blinds; largely due to the fact it is the most basic. Don’t let that deter you – the Classic is popular among homeowners due to its ease of use and practicality. The Motion Series operation system comes in two types: manual and motorised. The Manual Motion system is operated using an articulated crank rod. This German-designed mechanism features a built-in tension limit that regulates your blinds and ensures you’ll never over-tension them. Since this system can be used without electricity, it’s perfect if you’re looking at installing blinds on a standalone structure, such as a gazebo. Finally, we have the Motorised Motion system – the peak of outdoor blind technology. Controlled remotely, the Motorised Guide Track System is the premium option for those wanting to be in complete control. This system is super easy to use and can control up to five blinds with one single controller. It runs smoothly and quietly and it automatically maintains the tension of the blinds at any height. If you’re after the best operating system for your outdoor blinds, you really can’t go past the Motorised Motion system. The best part about the Motion Series is that it allows for a wider blind span, meaning it will do a better job of protecting you from the weather! Now that you have an idea of what sort of blinds might be best for your home, what’s the next step? It’s easy – just get in touch! We’ll provide you with a free measure and quote, as well as work closely alongside you to achieve the best possible outcome for your home. We’ve got nearly a decade of experience in this industry, and as a result we’re one of the largest providers of outdoor blinds in the country. Contact us today using the form on the right if you’re looking for premium outdoor blinds at an affordable price.